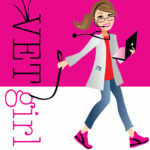 In today's VETgirl online veterinary continuing education blog, we review the importance of the PCV/TS. The PCV measures the percentage of red blood cells (RBC) to the total blood volume. This value is obtained when a blood sample is placed into a small hematocrit tube. Following hematocrit tube filling, the tube is sealed with clay and placed in the centrifuge for approximately 3 minutes (for most standard 10,000-12,000 RPM centrifuges). 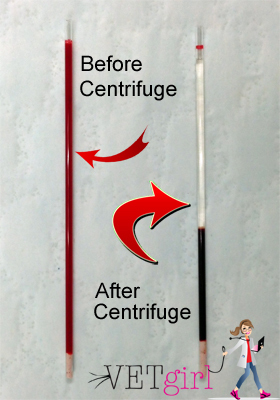 Following centrifugation, the RBCs are separated from the plasma. Plasma is mostly comprised of water, proteins, glucose, clotting factors, and mineral ions. When assessing the PCV and TP, it's important to evaluate these two parameters together. When evaluating the PCV, the first step is to decide if the value is normal. While the results may vary slightly based on age and species, normal PCV is approximately 35% - 45%. While polycythemia (a disease state where the proportion of blood volume that is occupied by red blood cells increases) is possible, most commonly, an increase in PCV is seen with dehydration (commonly termed hemoconcentration). A more common clinical problem - at least in the veterinary ER or ICU - is the dilemna of determining why the patient is anemic (e.g., low PCV). This is where evaluating the PCV in relation to the TP is handy! The TP is measured by breaking the hematocrit tubes (once the PCV is determined) following centrifugation, and placing the plasma directly onto the refractometer. The refractometer is then assessed (pointing it into the direction of light) - check out the picture to see the reading. The TP is the number read directly from the visible scale (in this picture, a total protein of approximately 1.6). Next, the color and clarify of the plasma should be assessed. If the plasma has a yellow-tinge, it typically represents an increase in bilirubin level. If the plasma has a red-wine color, the sample is typically hemolyzed (e.g., either due to traumatic venipuncture or direct hemolysis within the body, etc.). 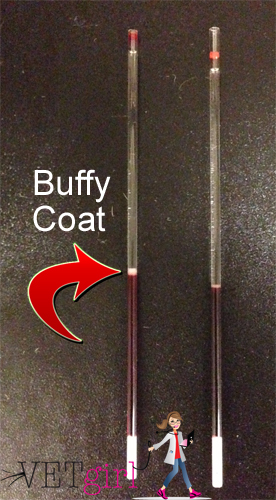 Lastly, the serum should be evaluated for the presence of hyperlipidemia (e.g., cloudy white plasma) or the presence of a large buffy coat (e.g., a thick, opaque white line found directly above the layer of RBC and plasma); this is typically due to presence of an elevated white blood cell count. Similar to the PCV, the TP may vary slightly based on age and species, with normal values ranging from 6.5 - 8.0 gm/dl. Elevated TP is most commonly seen with dehydration, with less common causes being chronic inflammation, neoplasia, infectious disease (e.g., FIP), or multiple myeloma. A lower than normal protein level can be seen with hemorrhage, malabsorption, liver disease (e.g., lack of production of albumin), gastrointestinal disease (e.g., protein-losing enteropathy), or kidney disease (e.g., protein-losing nephropathy). This chart created by Dr. Justine Lee, DACVECC, DABT is an example of how different combinations of PCV/TS can help narrow down disease quickly. so does readings of 45/6.8 and 40/7.4 mean pet is hydrated ok? Typically yes but if they are on IV fluids I WANT them to be hemodilute to a PCV of 35/5. Does normal PCV/TS mean hypovolemic shock is not likely? Not at all – there’s no good blood work parameter we look at for “shock”. Maybe lactate for perfusion, but normal PCV/TS can still exist with shock. Look at the patient for clinical signs instead. Would a PCV of 24 and TS of 4 after a c-section be a cause for alarm? We just heard about this PCV number for the first time, regarding our West Highland Terrier. She has had problems most of her life with her main problem being Addison’s Disease. Over the past year or two, digestion problems have been at the top of the list. Explosive problems. When she reacts to an episode by trembling and excessive panting, we panic and take her to the doctor. Her most recent episode occurred after vet hours and we took her to a local 24 hour emergency pet hospital. After poking and prodding as usual, one of the reports we received was that she was dehydrated and her PCV was at “57, and we like to have it below 50”. That is what and how we were told. So… we’re trying to educate ourselves to what this means and if we can help it! An elevated PCV is typically seen with hemoconcentration or dehydration. As your dog has Addison’s disease, she is more at risk for “shock” and hemoconcentration. When in doubt, talk to your vet about dosing her with more prednisone when she has “stressful” days (e.g., going to the groomer, going to the dog park, etc.). Good luck! PCV is 38% and his TP is 7.5 g/dl. Ideally, you want a full CBC, but this isn’t always available. Is there any differences between the PCV of 2-year old racehorse in training and 4-year-old racehorse runners? Thank you in advance.